The extensive backcountry of Bandelier National Monument is crossed by over a dozen long, branched, wooded and steep-walled canyons, separated by winding, grassy mesas, and containing dozens of ancient sites, both on the higher land and in the ravines. 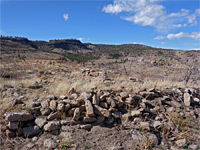 All are overgrown, mostly unexcavated, and often not always identifiable, but one at least does have more substantial remains; this is Yapashi Pueblo, a large and remote site on top of a narrow ridge between Hondu and Alamo canyons, near the center of the national monument, and reached by a 6 mile hike from the visitor center in Frijoles Canyon. 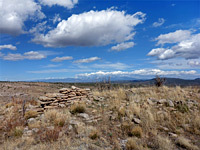 Yapashi Pueblo was inhabited between about 1200 and 1500, by the Keres people, and at its peak was a major village, with several hundred rooms, and structures up to three stories tall. The place was abandoned in the early 16th century, in common with other nearby settlements, and while not too much is known of its history, pottery fragments indicate trade with a range of other locations, including San Marcos Pueblo and Tonque Pueblo. Potsherds are still very numerous at the site, most of which consists of jumbled piles of stones, but there are several recognizable rooms, and walls up to three feet high. Besides the ruin itself, somewhat unremarkable to look at, but remote and atmospheric, the hike is also notable for the five canyons crossed en route; one (Alamo Canyon) is 600 feet deep and lined by volcanic tufa formations. The round trip takes five hours or more. 20 views along the Yapashi Pueblo Trail. 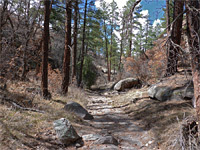 The hike starts from the trailhead at the end of the Cottonwood picnic area, on the floor of Frijoles Canyon. 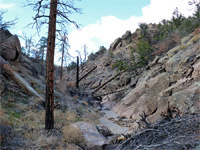 Three paths depart, one downstream to Frijoles Falls, one steeply up towards Frijolito Pueblo, and the other to Yapashi and several other destinations. This also ascends but not too steeply, while moving northwestwards, diagonally up the canyon wall, to a four-way junction on the rim. Here, the left path is to Frijolito, the right follows the edge of Frijoles Canyon for several more miles, while the Yapashi route is straight on. The trail very soon crosses a shallow ravine, an eastern fork of Lummis Canyon, then traverses a treeless, short grass plain below the low peak of Corral Hill; generally rather featureless scenery. After a while the land descends gently then briefly more steeply into the main fork of Lummis Canyon, which is lined a few tall pine trees, beside a narrow, gravelly streambed. The path heads downstream a few yards then climbs the far side, passes over a saddle and drops down to another minor ravine, a western fork of Lummis Canyon. The surroundings stay generally open, with far-reaching views towards the surrounding mountains. Three miles from the trailhead, the path arrives at the rim of the largest canyon, Alamo, which is similar in scale to Frijoles, though somewhat narrower. The path begins a steep, 550 foot descent via many rock-cut steps, initially through a vertical layer then past many boulders and bushes, a section that is exposed and often very hot in the afternoon. 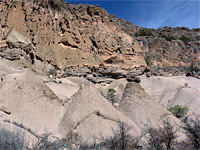 The cliffs contain several distinctive horizontal layers, including a band of light-colored tuff just above the creekbed, partly eroded into cones and tepees, similar to the Tent Rocks. The canyon floor is cool and moist, shaded by tall pines either side of the streambed, which is usually dry, though big brush piles are evidence of occasional flash floods. After walking downstream for a third of a mile, the climb up the west side of Alamo Canyon is similarly steep, starting with a longish straight followed by many short switchbacks. The canyon below is now somewhat wider, and contains fewer trees. Once west of Alamo Canyon, the trail soon passes over the next ridge and descends into a narrow, rocky, western fork of the drainage, comparable in size to Lummis Canyon. It quickly climbs back out, then heads northwest along the rim a short distance to a junction, signed Yapashi 0.5 miles; the other branch goes south to the Painted Cave, an even more distant backcountry site. The final section climbs steadily, all along a ridge, to the pueblo, which sits close to the base of steeper slopes to the west, above the upper end of Hondu Canyon. There are no trees hereabouts so nothing to block the panoramic views. 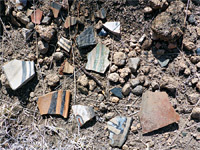 The ground in and around the pueblo is strewn with hundreds of pottery fragments, many with decorative patterns, and the largest around 3 inches across, mixed with obsidian and colorful mineralized stones. Tree cholla (cylindropuntia imbricata) grows amongst the ruins, most of which are reduced to lines of greyish-white stones, though room boundaries are still evident in many places. There are also several metates - flat rocks with shallow depressions, used for grinding corn.